A kit to make traditional Ginger Beer. Using ingredients from the kit a yeast prepartion is created and is left to ‘grow’ for a short period of time. 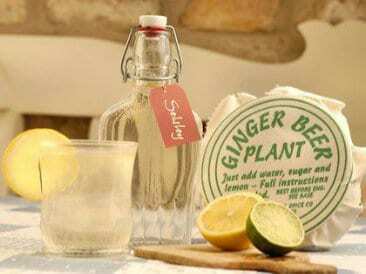 Then using some, but not all of the yeast mixture, a ginger beer drink can be made easily following the instructions, and using the ingredients, contained in the kit. The residue yeast can be reused by adding more ingredients to it and the process can be repeated all over again. Contains instructions and all ingredients except water, sugar and lemons. 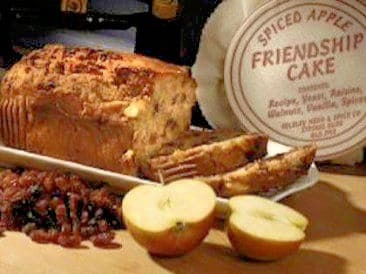 A kit to make a Spiced Apple Friendship Cake. Using ingredients from the kit a yeast prepartion is made and left to ‘grow’ for a short period. A dough is then prepared using some, but not all of the yeast mixture and a cake can then be made following the instructions and using the ingredients contained in the kit. Traditionally, a small amount of the mixture was passed to a neighbour or friend to enable them to make their own cake. Contains instructions and key ingredients to make your cake.